1.0.1.1 Important: getting sent to voicemail does not always mean you’re blocked! 2 How can I find out exactly what happens if someone blocks my number on an iPhone? Have you ever wanted to know if someone blocked your number from calling them or sending them messages? You may be familiar with the process of blocking calls, messages, and contacts on the iPhone, but have you ever wondered if YOUR number or messages have been blocked? While Apple makes the blocking feature for texts and calls fairly subtle, and blocked calls can even still leave voicemails, there are a few ways you can try to determine if someone has blocked your number on iPhone. Read on to learn more! There are a few ways you can potentially determine if your phone number has been blocked by an iPhone user. We’ll show you a few ways to help figure it out. Note that you have been blocked by the recipient iPhone, that recipient iPhone will not ring or make any notification or sound that you have called, nor sent them a message, nor left a voicemail. From the end that is doing the blocking, their iPhone stays silent and undisturbed by an inbound blocked call. 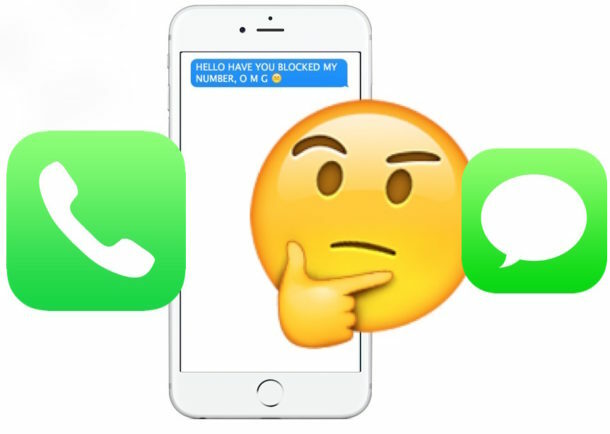 If you have been blocked by someone with an iPhone, then calling the iPhone results in one ring, or no ring at all, before hearing a generic message stating that the person is not available. If the recipients iPhone has voicemail setup, the call is then directed to voicemail. (And yes, blocked callers can still leave voicemails, and you can check voicemails from blocked callers on iPhone too with these instructions). If you hear multiple rings and eventually get to voicemail, most likely your call and number has not been blocked. Important: getting sent to voicemail does not always mean you’re blocked! There are other reasons you may get sent to voicemail quickly too. Don’t assume getting someones voicemail is because you have been blocked by the person. You can also try to check if your number has been blocked by sending the person a message. If the iMessage never shows a “Delivered” or “Read” message, and it’s still blue, then you may have been blocked – but not always. If the iMessage goes through and shows a “Read” receipt, then you have definitely not been blocked. Remember that Read Receipts can be disabled completely, or enabled broadly, or enabled on a per contact basis, but there is no way to determine which is the case unless you have specifically discussed it with the recipient or checked the settings on their iPhone (or iPad). If the iMessage goes through and shows a “Delivered” message, then you have probably not been blocked. If the iMessage fails to send and after repeated attempts at sending the message, and if the message turns green rather than blue, the person may have no cellular service, has no data connection, has a problem with their cell service, has a problem with their iPhone, has iMessage turned off, uses an Android phone (or other platform), or possibly has their iPhone turned off or is in the process of rebooting. There are many reasons why someones iMessages may not be working, and it’s no indicator of being blocked by the person. Remember, when messages are being sent as green instead of blue, that means the phone is attempting to send a traditional SMS text message instead of an iMessage. 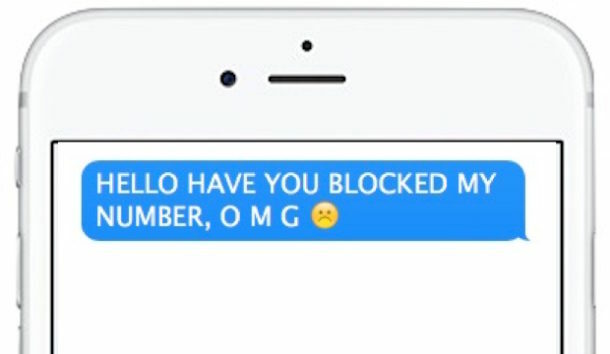 How can I find out exactly what happens if someone blocks my number on an iPhone? There is no perfect solution or guaranteed way to find out if someone has blocked your iPhone without actually seeing their blocked contact list, but the next best thing is to setup a test for yourself. A quick test is pretty easy as long as you have a friend or family member with another iPhone. Simply block the number of your iPhone from their device, then call it and send it a text message or iMessage. You’ll discover that you’re either sent to voicemail, or the messages just appear to go nowhere. Just be sure you unblock the number when you’re finished with the test so that you can actually get through to the person you tested this out with later.